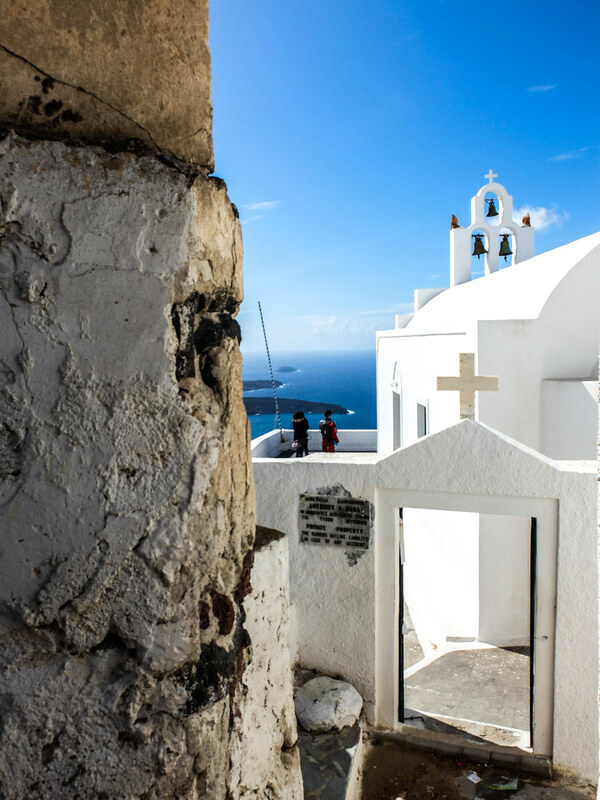 Ah Santorini, everyone’s dream destination, particularly for the romantics and the hopefuls. 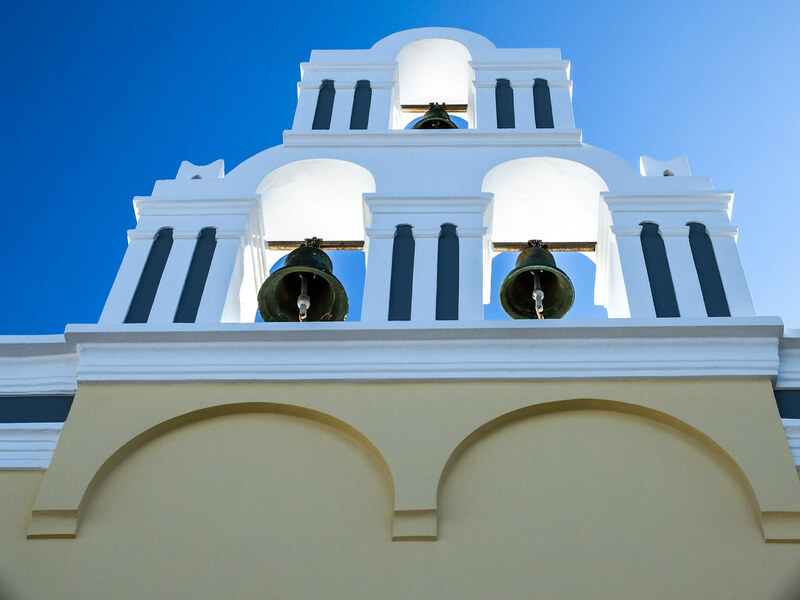 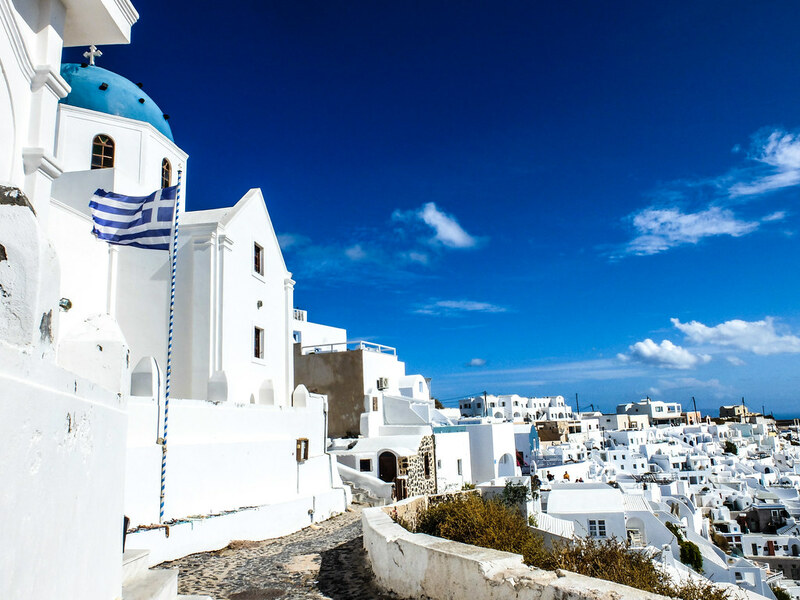 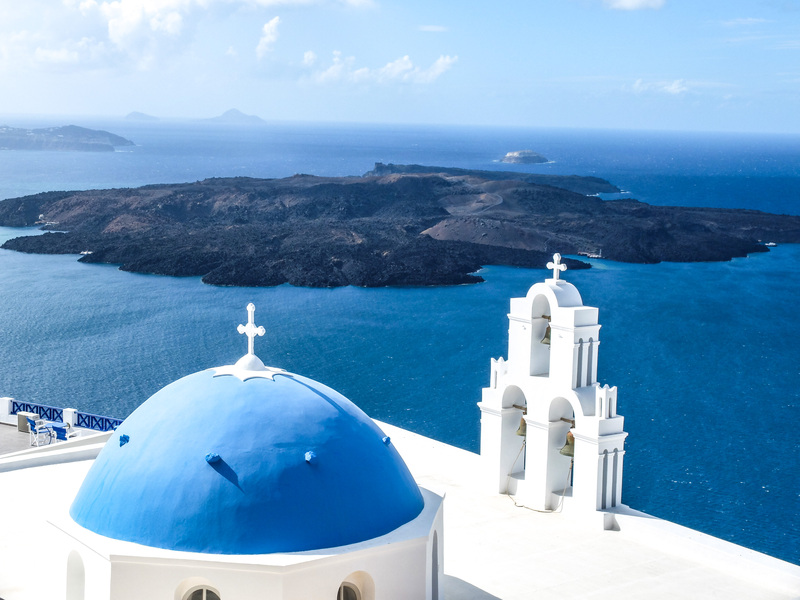 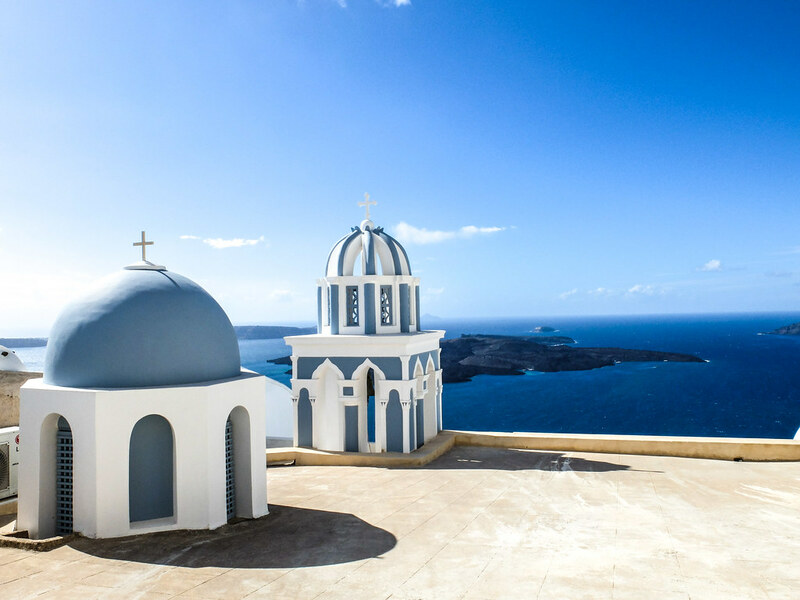 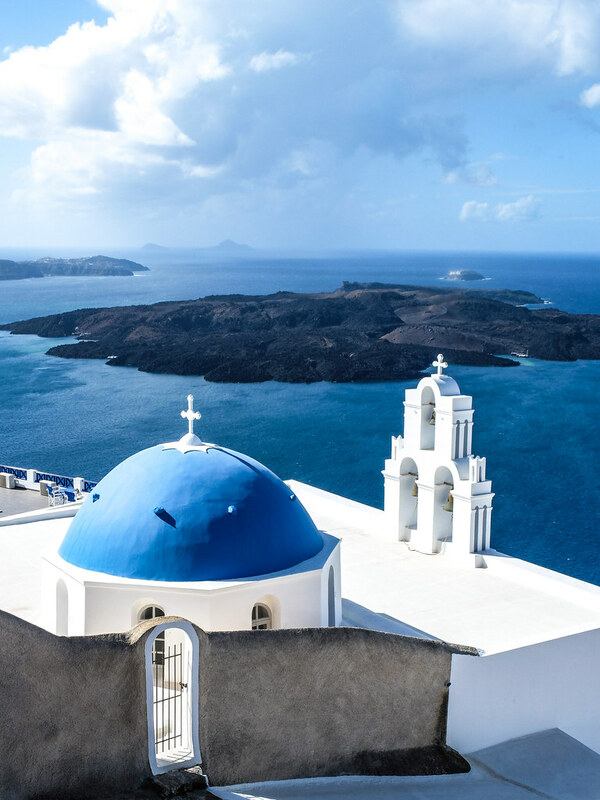 The image of the whitewashed buildings and the famous blue-domed churches, perched on a rim of an active volcano with the endless clear waters of the Aegean Sea in the horizon, it is truly the poster perfect image of a Greek island and the very definition of what a getaway is all about, a place that is truly different in all aspects wherever you came from. 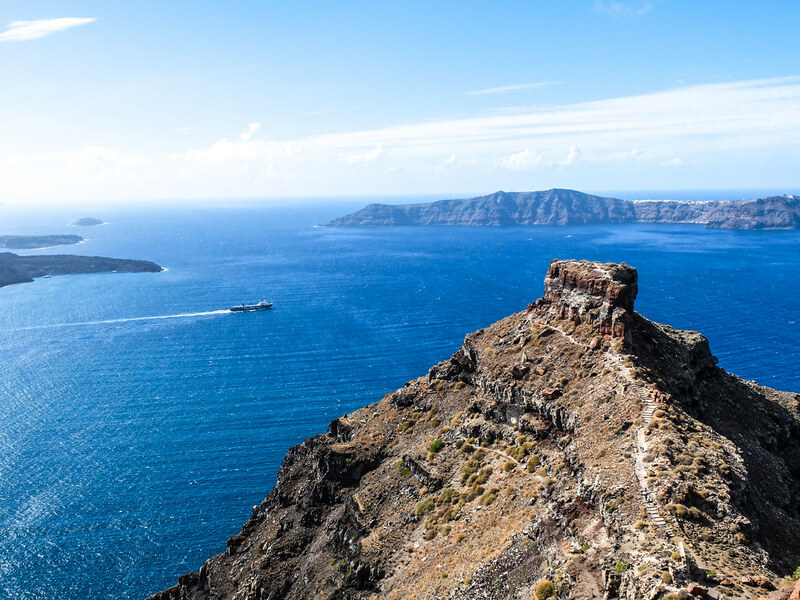 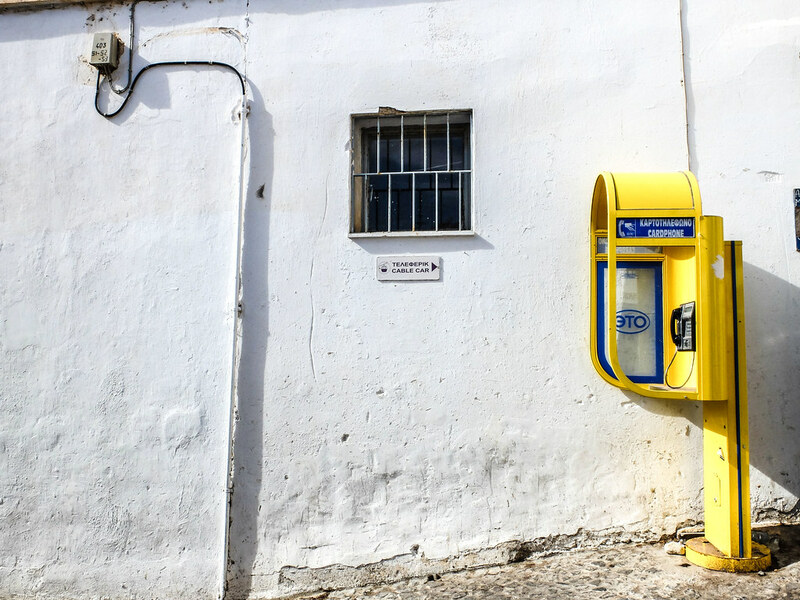 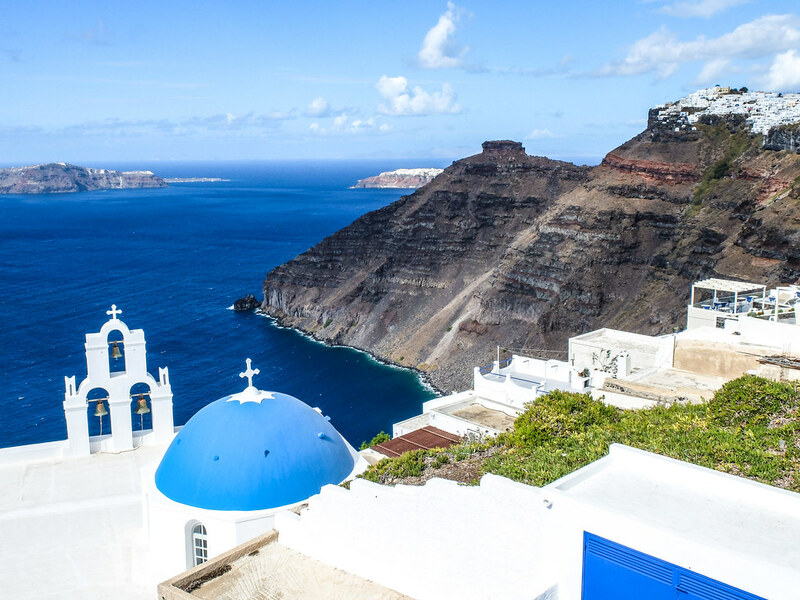 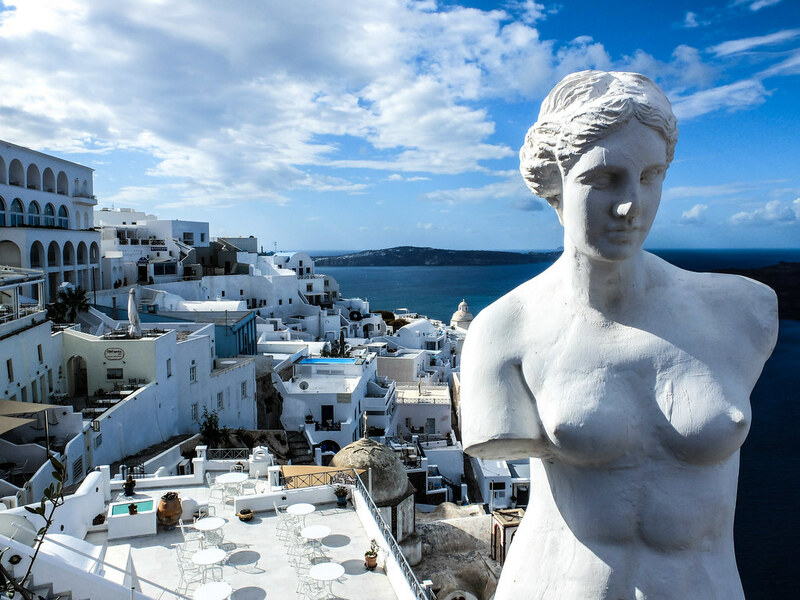 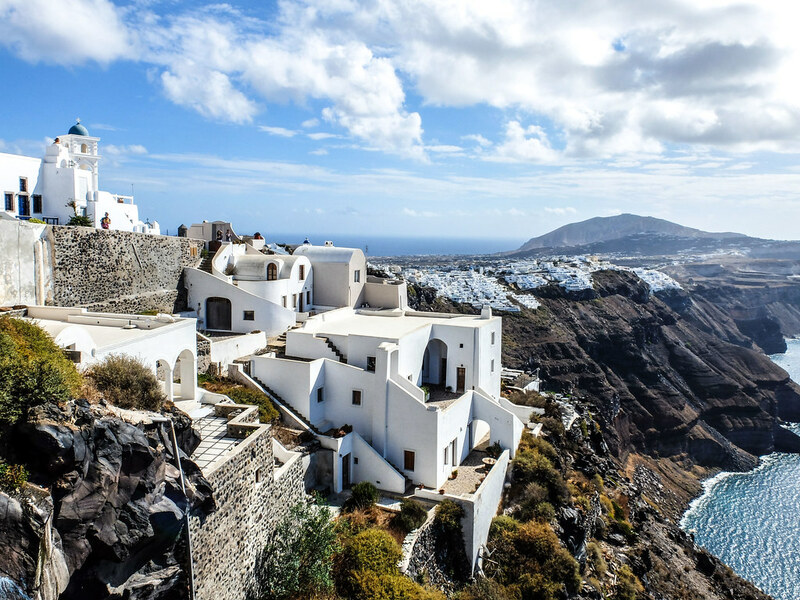 There is no doubt that Santorini or officially called as Thira is a worthy place to cross out in everyone’s travel lists and nowadays, one of the destination that is no longer reserve for those that can afford only. 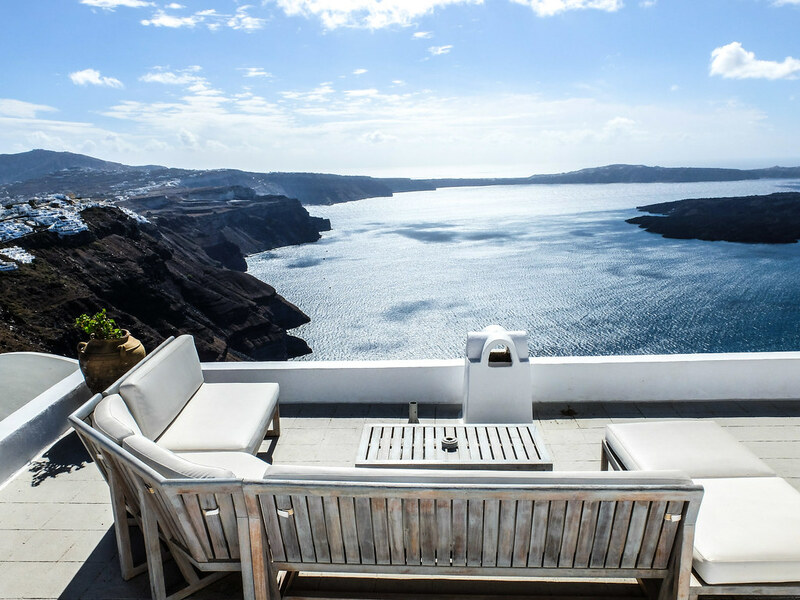 But obviously, the experience will be different, say if you have a money to spend in a bungalow in Oia, with a glass of champagne in hand while watching the sunset on your private balcony , than those who travel backpacker style, stayed in a hostel in the local town of Karterados, a 30 minute walk to the town of Fira and then has to take the bus to Oia for the coveted sunset view. 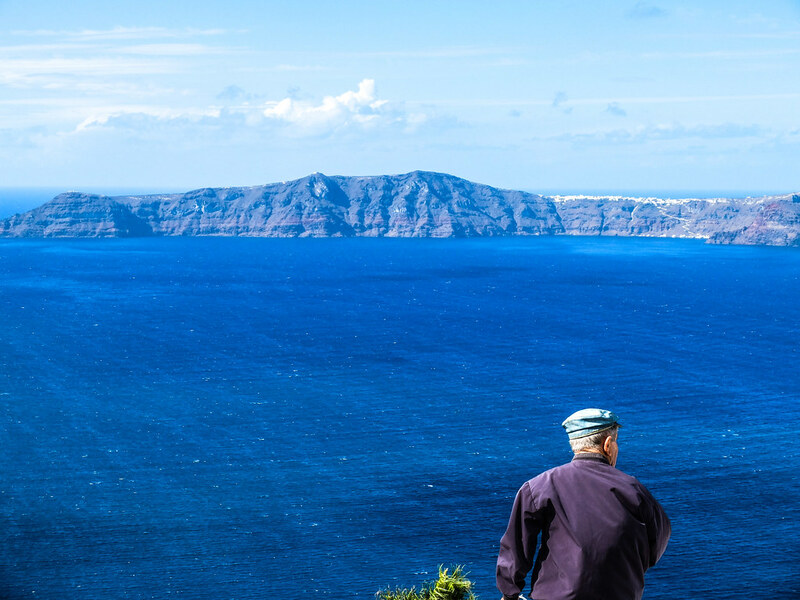 But whichever way you choose to spend your time in Santorini, everyone will get to enjoy the same one of a kind view. 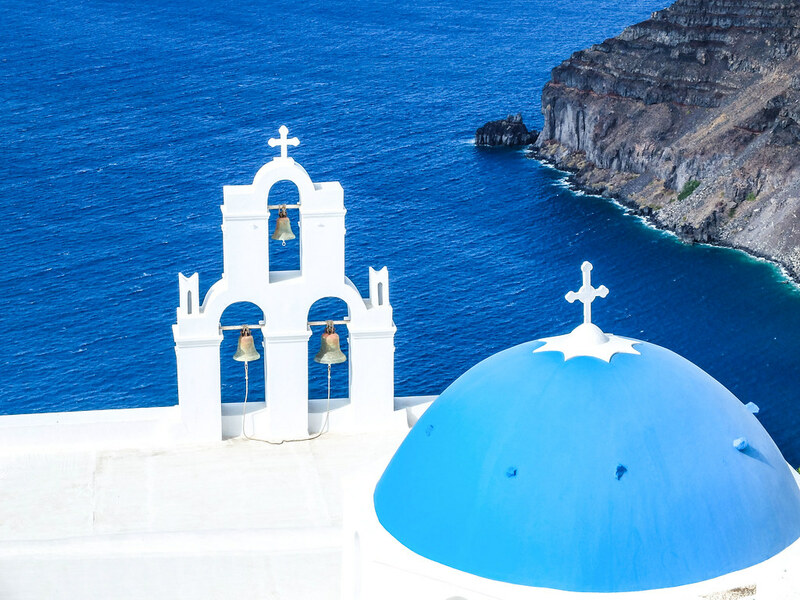 There are moments I literary have to pinch myself in awe while standing in front of the blue-dome of Aghioi Theodoroi Church (Saints Theodore), the image I only see on the cover of travel books and I smile like an insane person whenever I see the panoramic caldera view, the image they often use on those write-ups about places to see in your lifetime. 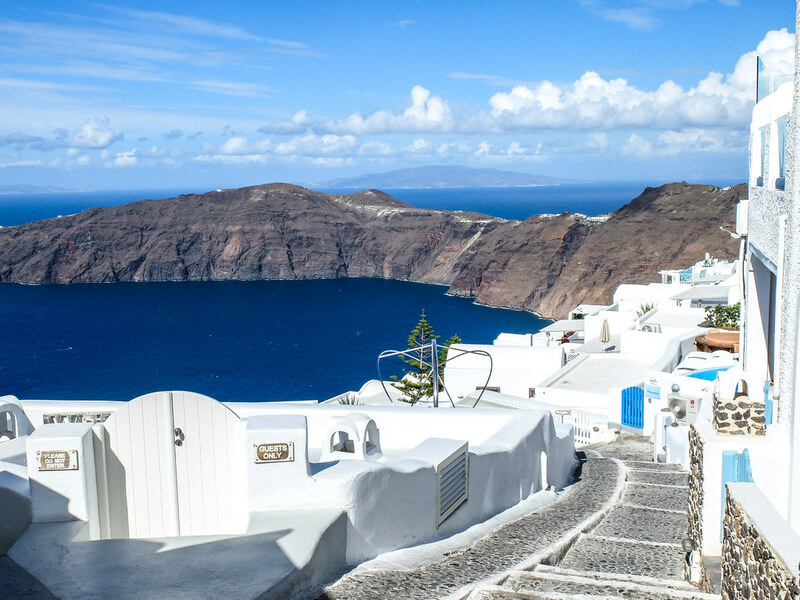 Santorini can be an expensive destination, compare to the other Greek islands, but the good side is the top thing to do in this island is for free, and that is to walk and just simply enjoy and admire the view. 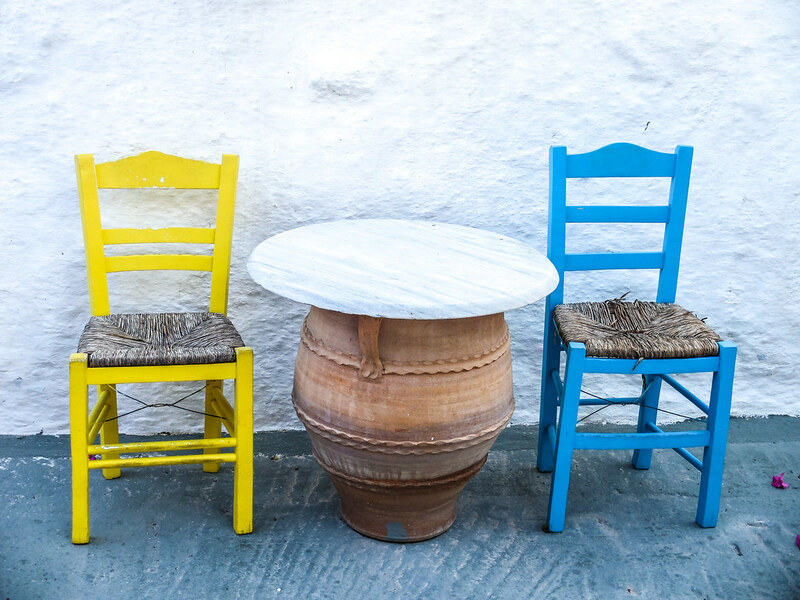 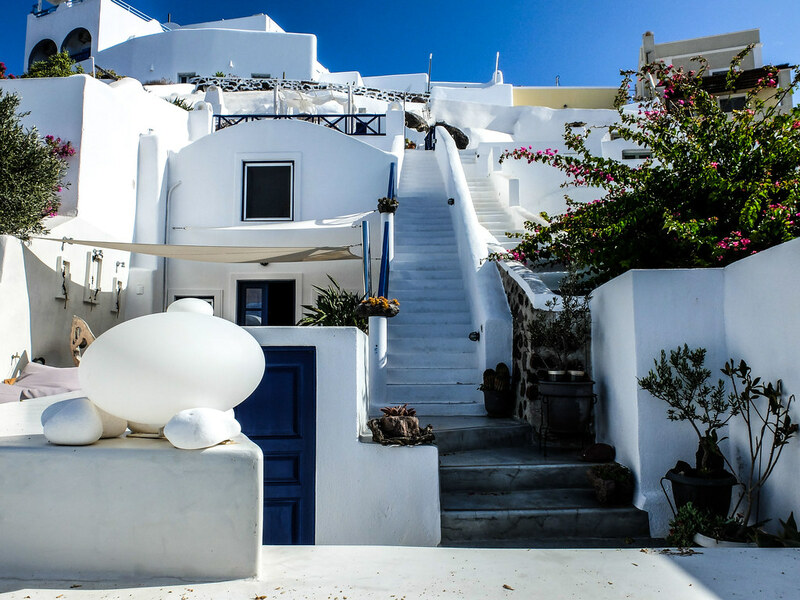 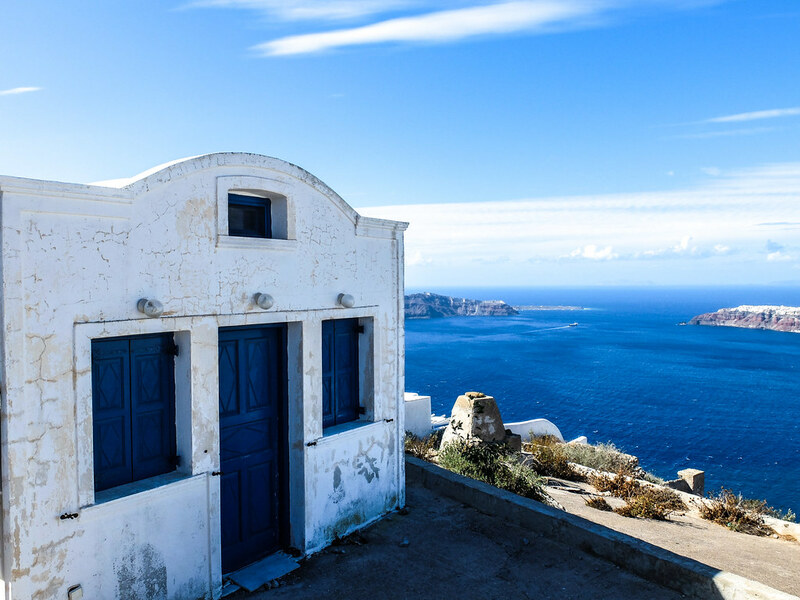 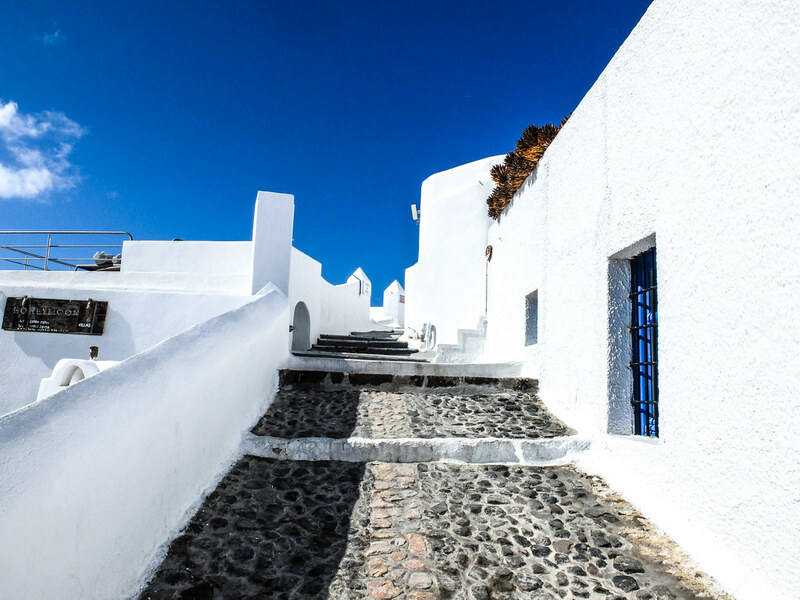 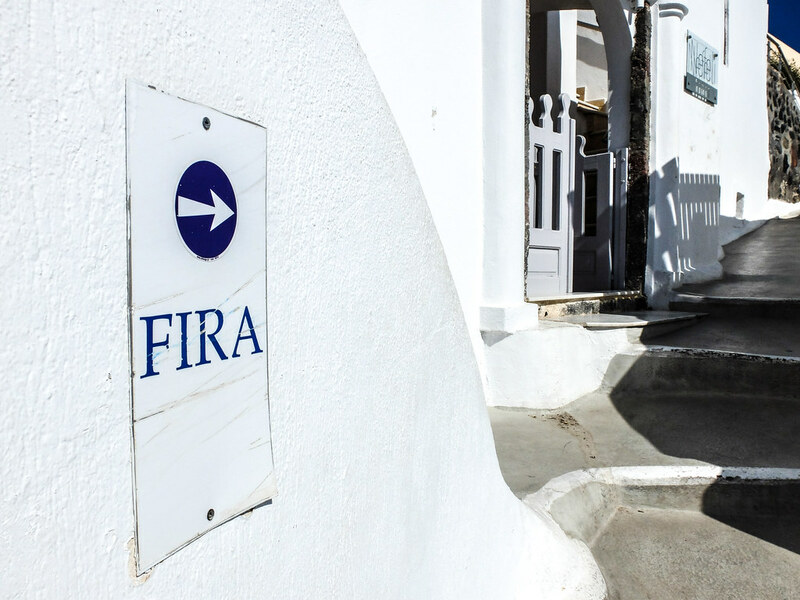 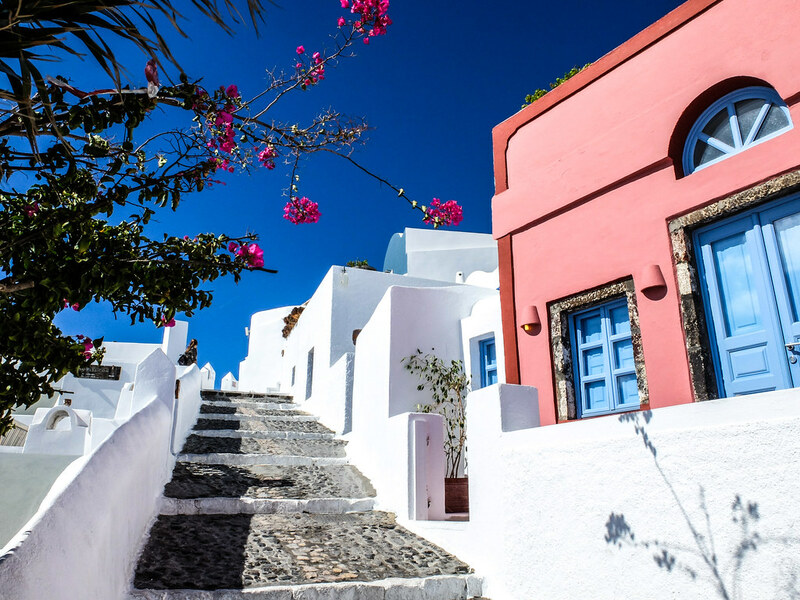 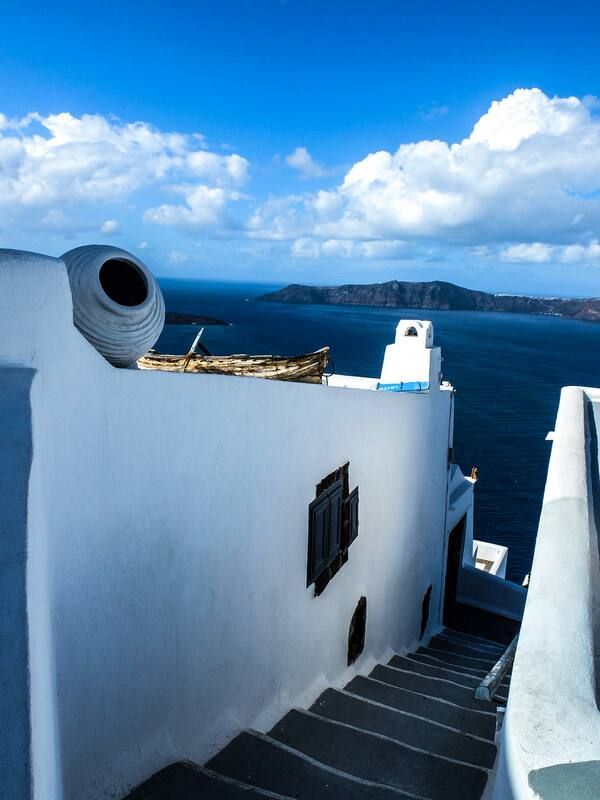 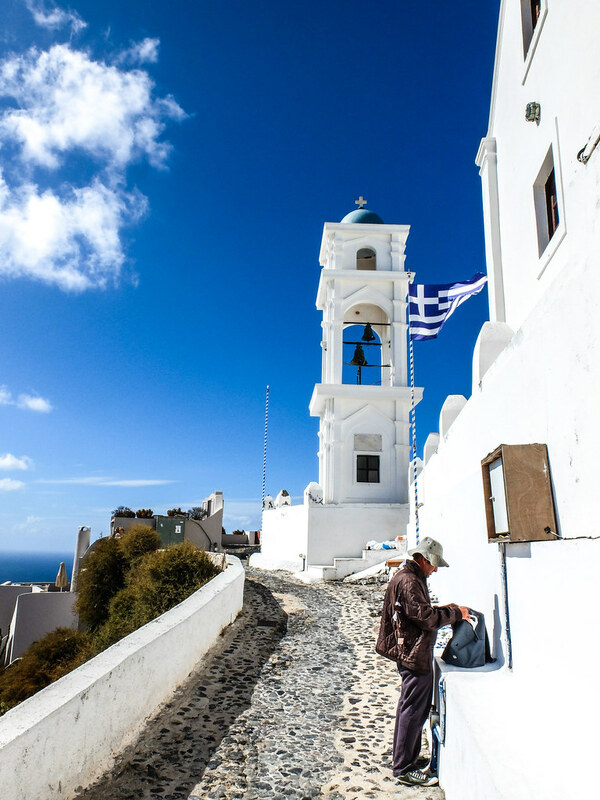 The best place to get acquainted with the island is to start from the town of Fira, the capital of the island and head north to Firostefani , Imerovigli and further to Oia if you are up for a challenge. 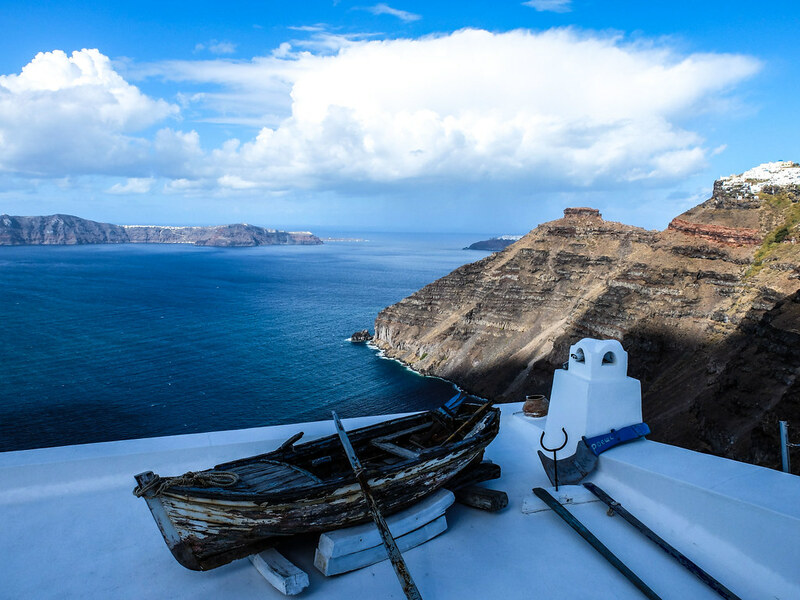 I was very determined to do the Fira to Oia walk, an approximately 9km journey along the caldera-edge pathway, but my midday timing is not a good decision and it was so windy, making the walk quite difficult. 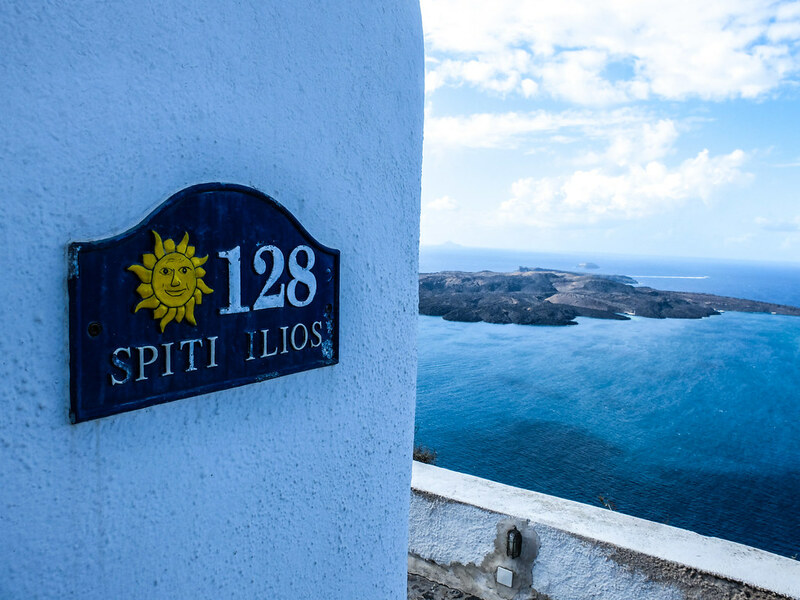 This leads me to abort my mission after reaching the town of Imerovigli, and reserved Oia later for the sunset. 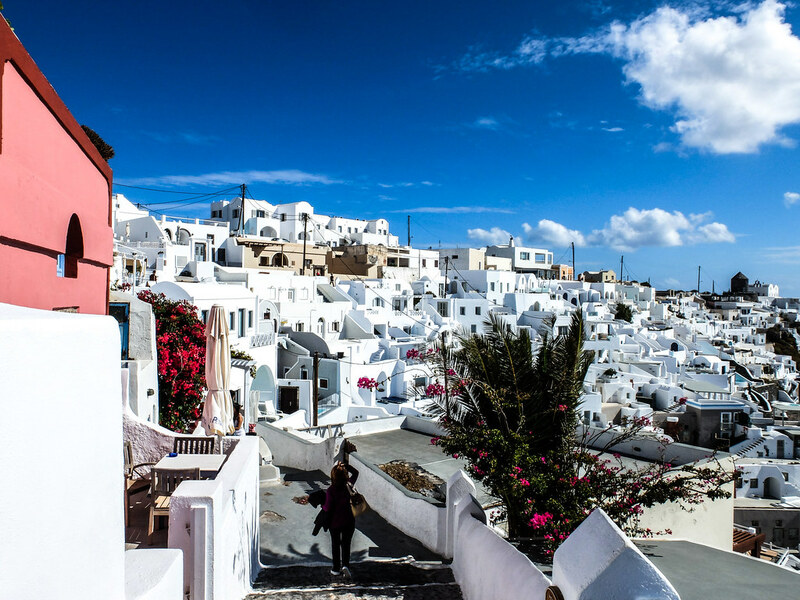 With a local population of 2,000 only, along the caldera pathways are the usual cafes, restaurants, hotels while the back-alleys are mostly souvenir shops, all are aptly decorated uniformly to create the unique Santorini ambiance and all dedicated to cater for tourists wants and needs. 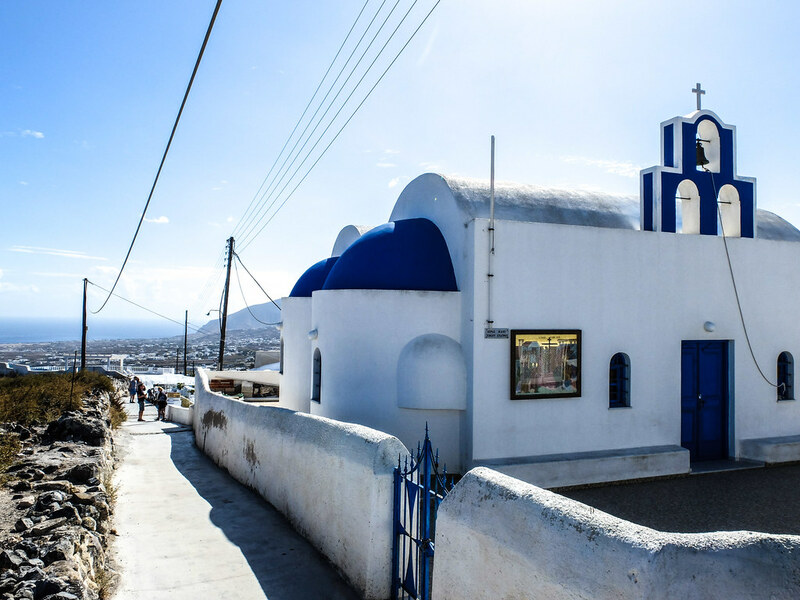 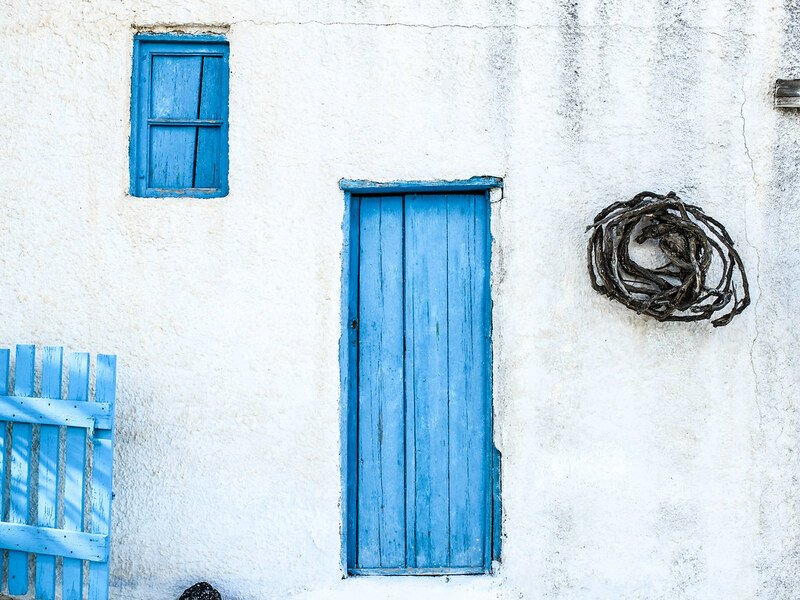 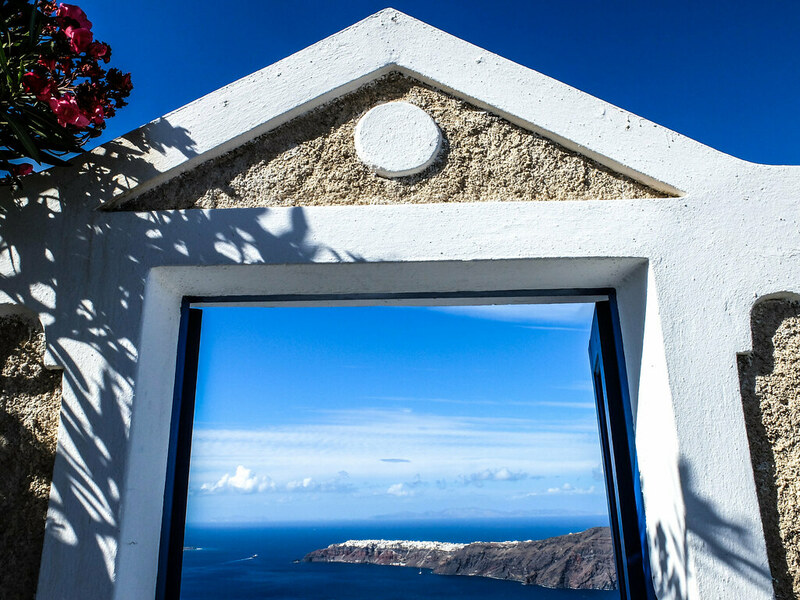 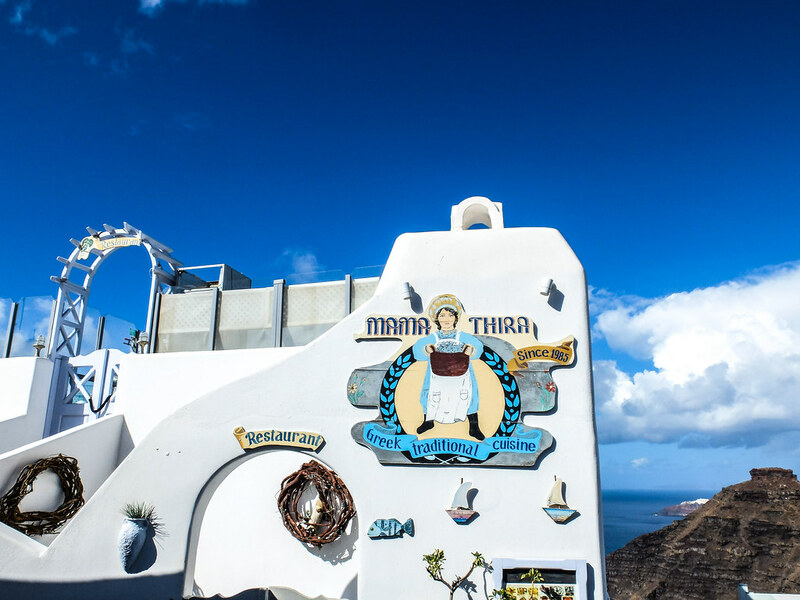 Fira and the other nearby town is truly one for the books, it is a mesmerizing destination in every angle, so you have to let go your inhibitions and allow yourself to take as many photos as you want, particularly for those who loves the color blue.